I was on the brink of my thirties, stuck squarely between my father's recent death and my son's quickly approaching first birthday, when I took my seat at Victoria's station and told her I wanted to cut it all off. Oh, and dye it red. And she didn't bat an eye. I so desperately needed a change, and as my hair fell to the ground, taking with it layers of the old me, Victoria and I chatted about everything from our toddler boys, the joys of being a mommy, marriage, our parents' cancer and how God fit into all of the above. Our conversation was so natural. I felt I had known Victoria for years instead of the hour or so we had actually been acquainted. This was a feeling I had only experienced twice before: when I met my teenage best friend, Joanna, and when I was introduced to my husband, Will. Yet, here it was again - with my hairdresser, of all people. Within a few months of our first meeting, Victoria had given birth to her second son, Jude, and I found myself expecting once again - also a boy. It seemed only natural to get our little guys together to play trains and burn off some energy running around outside. Despite the drama of our first play date at Victoria's house, which was cut short by Wilson's first asthma attack and subsequent trip to the emergency room, we continued to meet to play and have lunch nearly once a week. As a friendship blossomed between Wilson and Reed, so too did my relationship with Victoria. I channeled my inner thirteen year old girl, routinely giggling and gabbing on the phone for hours on end after the boys had gone down for the night. Around this time, Will began teasing me about the intensity of my newfound friendship. He jokingly referred to Victoria as my "BFF," my "bestie" and my "girlfriend." He even gave her a nickname - The Vickster. (Although I think this may be the first time she is hearing that one). But, for all of the carefree times we shared together, life as Victoria knew it was changing. She was forced to make some hard decisions about what kind of life she wanted for her boys and what she could and could not accept in her marriage. Although I tried my best to walk by her side through this difficult time, the truth is, I really don't think I had any idea what she was going through. Although I continued to pray for her marriage, I can't say I was surprised when it ultimately ended. My heart ached for her and the boys, but I knew that she had only their best interests guiding her every move. Their mommy loves them fiercely. Following a month long trip to Missouri to visit the boys' paternal grandparents last summer, Victoria returned with news I could not have seen coming. She planned to move to Missouri in just a handful of weeks to attend nursing school. Although I knew she was making the best out of a difficult situation by preparing for her future as a single mom, I was heartbroken. I tried not to take her move personally, but between you and me, I felt abandoned. I had waited all of my adult life for a friend like her and I was having a hard time letting her go out into the world without me. Life without Victoria was a hard pill to swallow. I relied on the rare phone conversation to assure me that our friendship was still there, waiting. During one of those conversations, Victoria said that she and the boys would be making their first trip home to California to visit her family. I marked my calendar and eagerly began the countdown. Then, earlier this week, while trying to herd my little ones and get everyone ready to head out the door, I happened to glance out the front window and saw Victoria walking up my driveway! A whole day earlier than expected! I ran outside and grabbed her hard to hug her. The long nine months apart and all of those selfish feelings melted away as I stood on my front lawn, barefoot and beaming, reunited with my best friend. And, here's what I love about this girl: thousands of miles away, reading these little blogs of mine, Victoria felt moved to bake me happy. 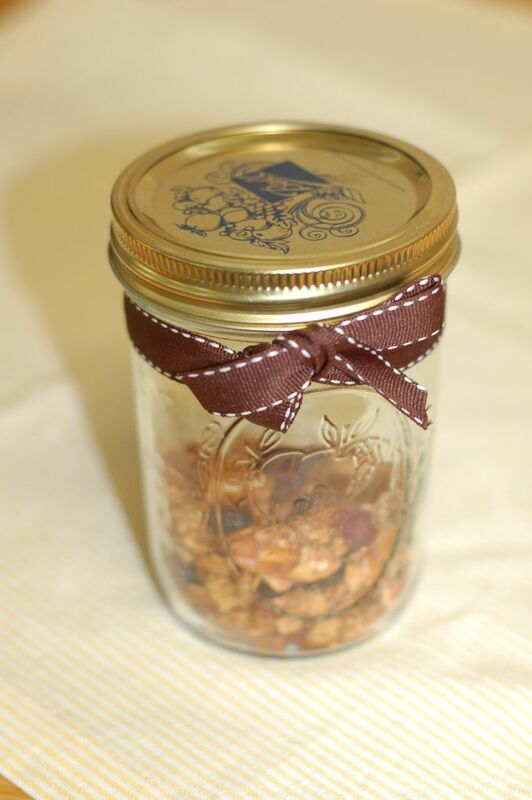 Inspired by my first blog where I share my not-so-secret desire to be the kind of mom who makes her own granola, she arrived bearing a lovely little mason jar filled with homemade cranberry almond granola. Little did she know, she had a pie coming her way in just a couple of days. So, what do you do when you are so happy to see your best friend your cheeks hurt from smiling? Why, you make a pie of course! So, I present, Victoria's "Missouri Loves Company" Missouri Buttermilk Pie. Victoria's pie has been made in my head dozens of times. 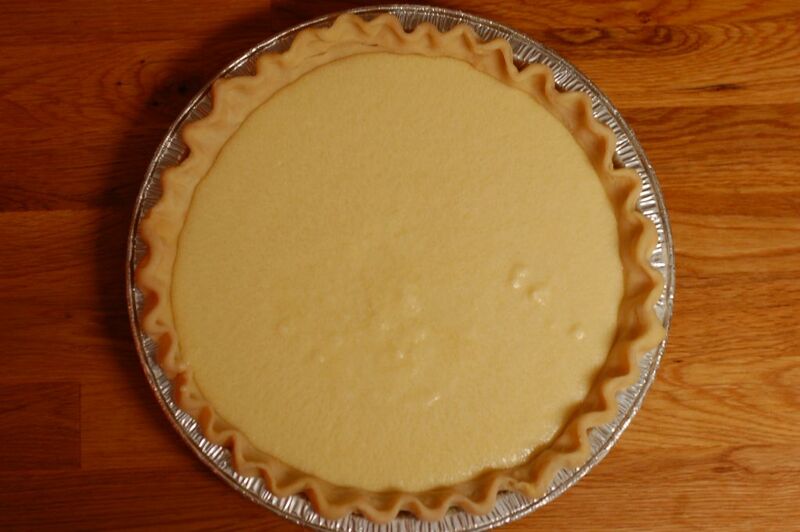 When I first began Bake Somebody Happy, I stumbled across a recipe for Missouri Buttermilk Pie - a pie originally prepared by the head chef of the U.S.S. Missouri for President Truman during his visit to the ship - and bookmarked it for the appropriate time. Well, the time is now. 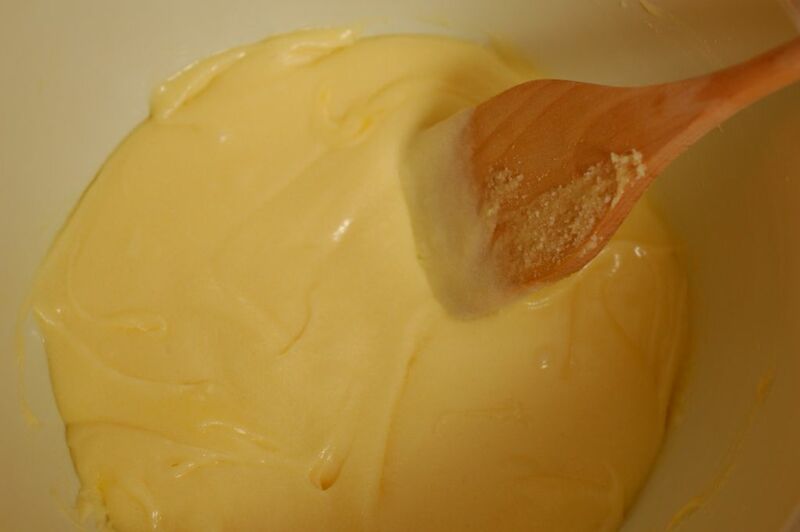 I began, as usual, with my tried and true pie crust recipe, made with equal parts butter and shortening. I am pretty sure I could make this crust in my sleep at this point. The old Erin - the one whose muffins never rose - would be extremely impressed by this progress. I guess my childhood piano teacher was right when she nagged me about the importance of practice. But, I digress. Back to the pie. 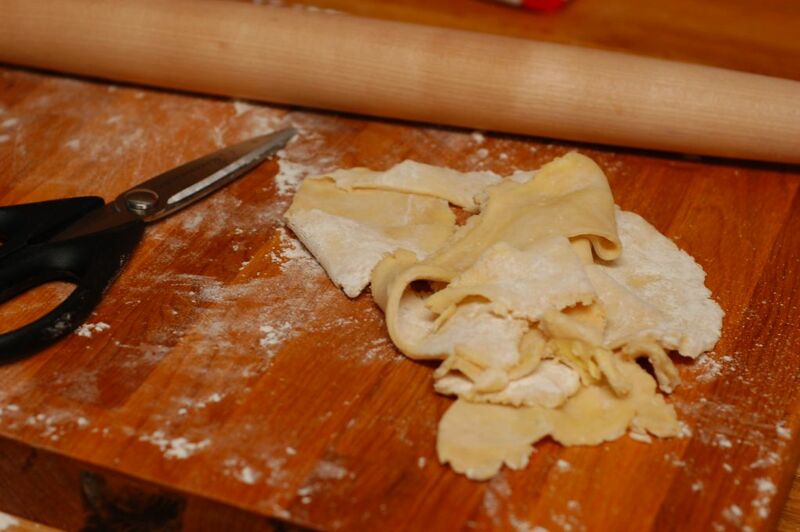 Later that evening, after the boys had gone to bed, I tied on my favorite apron, generously floured my butcher board and rolled out my chilled dough. 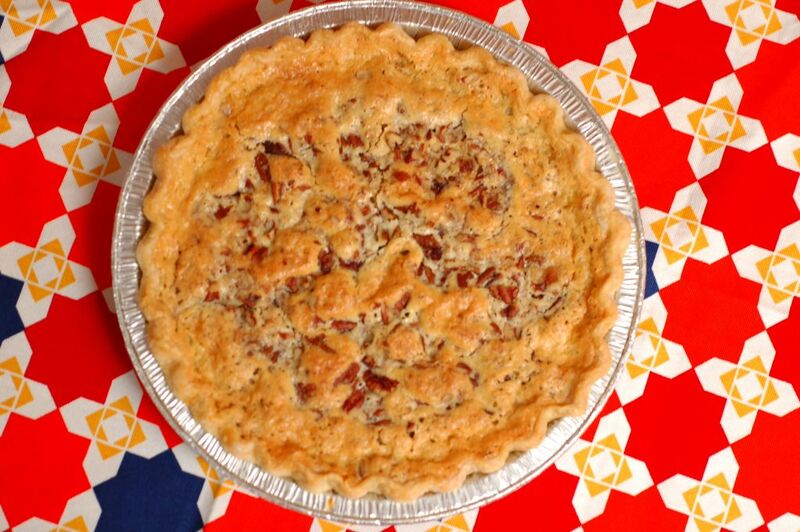 Once I had achieved a uniform, thin sheet, I transferred it to the pie tin, trimmed the edges with my kitchen shears, tucked the excess dough under and crimped my way around the perimeter. 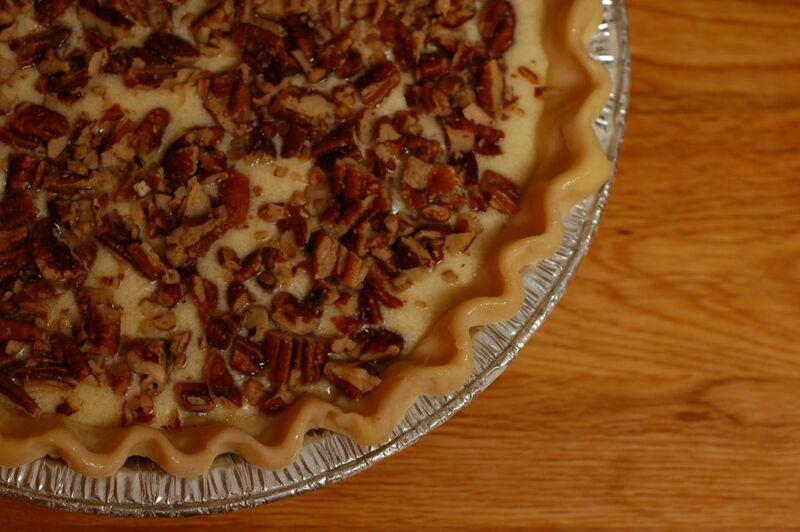 A Missouri Buttermilk Pie traditionally calls for a topping of toasted, chopped pecans. 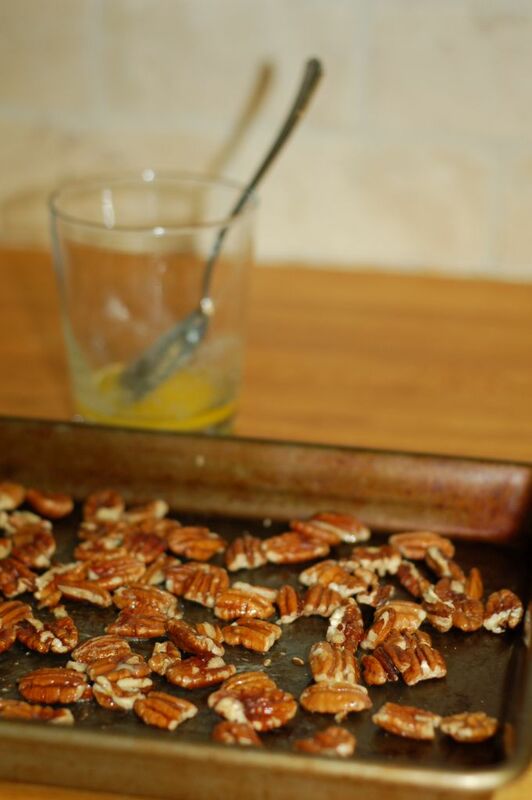 But I decided to fancy things up a bit by tossing my pecans with melted butter and a sprinkling of coarse sea salt before toasting. Ten minutes in the oven and a warm nuttiness filled my kitchen, stirring in me a longing for fall and all of the holiday pies it will bring with it this year - my first holiday season baking pies. I can't wait! Typically, I begin the process of baking a pie with a main ingredient, search the internet for inspiration, settle on a handful of recipes and combine and tweak them to make the final result truly my own. 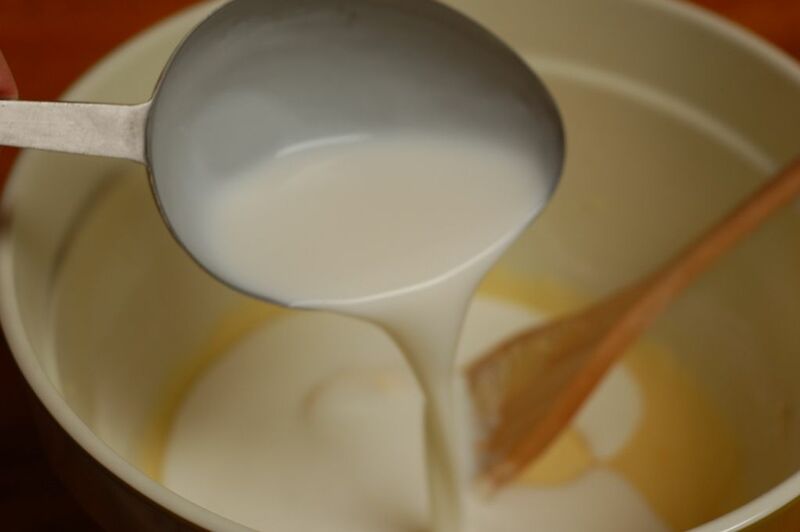 But, in this case, I opted for tradition, as every recipe I found reiterated the importance of not altering measurements or substituting ingredients. 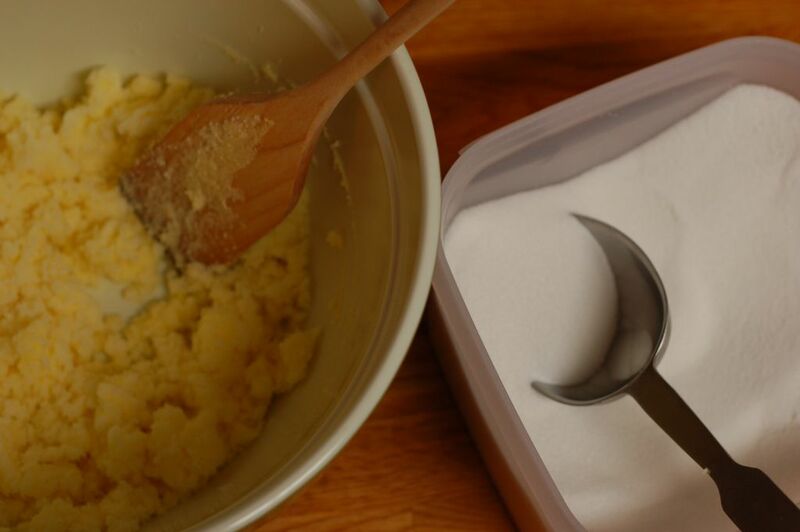 So, I began by blending the sugar into the softened butter, as directed. 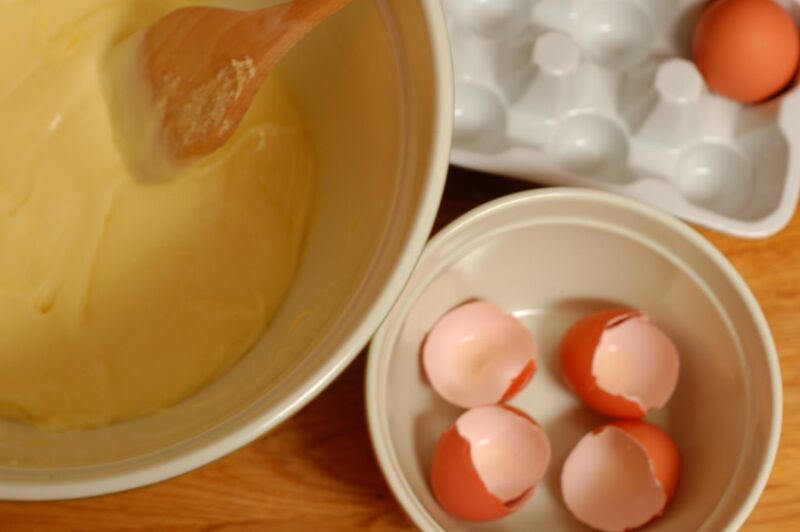 Once combined, I added three whole eggs, one at a time. Which reminds me, I am still waiting on my girls to begin laying. Hopefully come October, I will have fresh eggs right in my own backyard, just begging to be used in a custard pie. 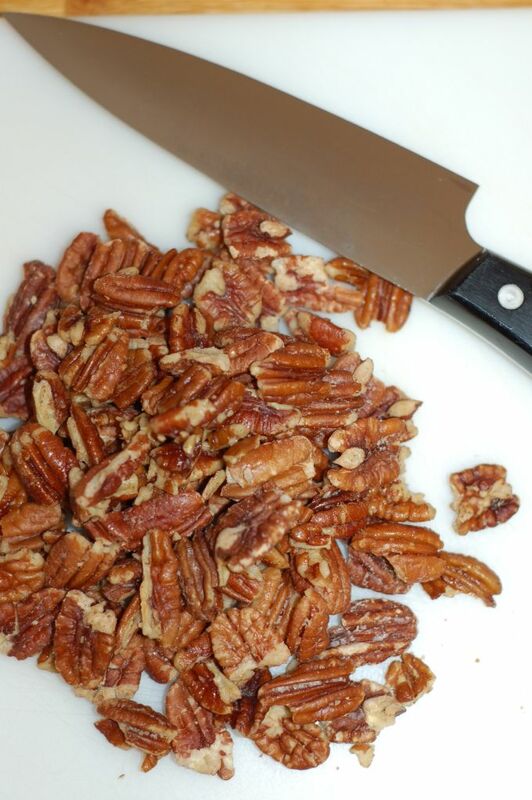 I filled the chilled shell to the brim with the buttermilk filling and topped the pie with a generous amount of chopped, toasty, buttery pecans. I glossed the edges with an egg wash and placed the pie on the middle rack of the preheated oven for just over an hour. Then it was time for the taste test. Removing the mini pie from the tin, still warm from the oven, and breaking into that dense, rich custard with a fork was all I had hoped for. 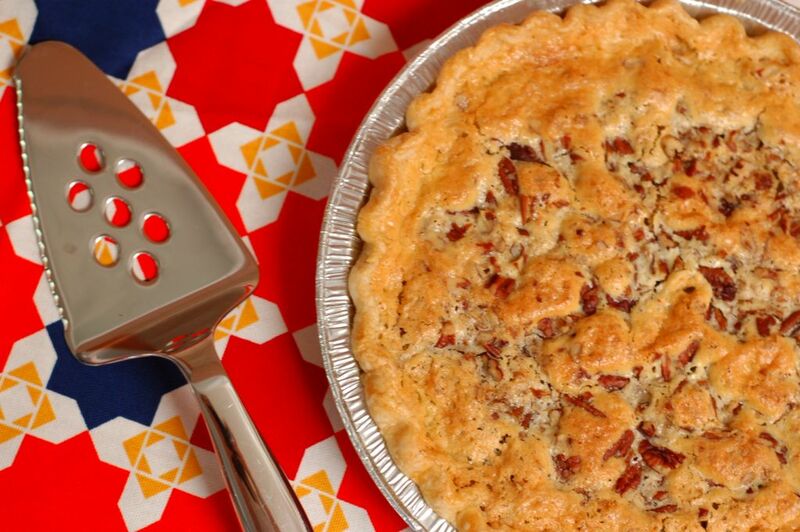 I know I was a bit hesitant about the buttermilk flavor, but, let me tell you, this pie is a show stopper! Will has gone so far as to say that this is his favorite pie yet. And I think I may just have to agree with him. 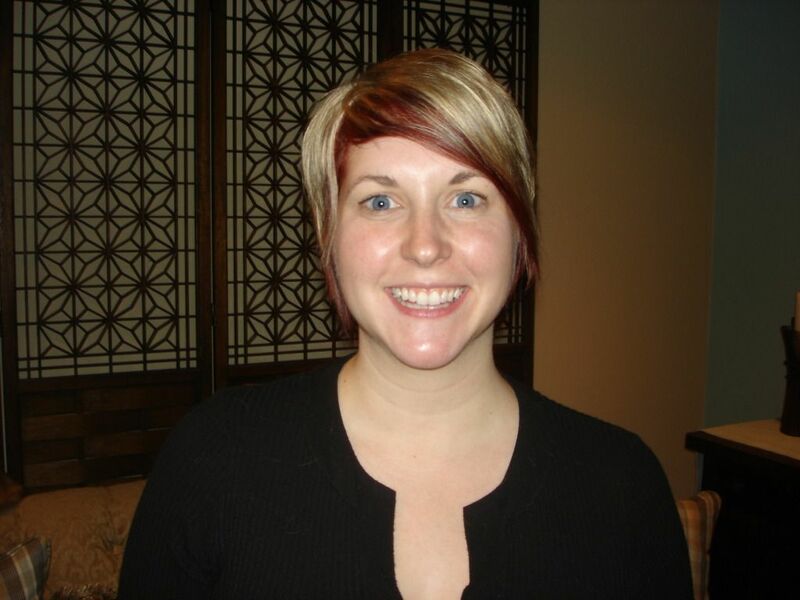 Although my intent was to reinvent myself with a drastic new haircut, that fateful trip to the salon ushered in my thirties with something much more permanent - the making of a best friend. Not unlike this pie, sometimes you find new favorites in the most unexpected of places. I still struggle with goodbye, but I am comforted in knowing that our friendship can endure distance and time apart and come out even stronger. 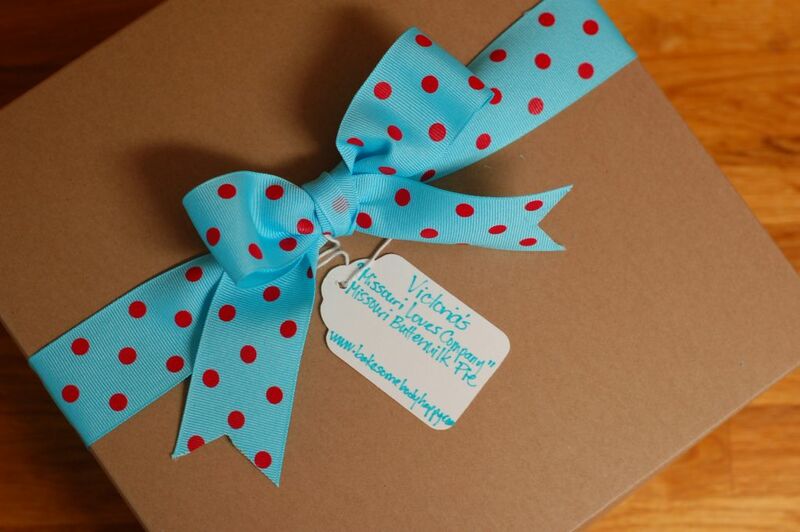 Whether in California or Missouri, I still love Victoria's company as much as ever. I love getting to see our story in your blog! So well writteb and kind. Thank you, Erin! Our friendship is such a gift to me. God really knew what he was doing when he sat you in my chair. 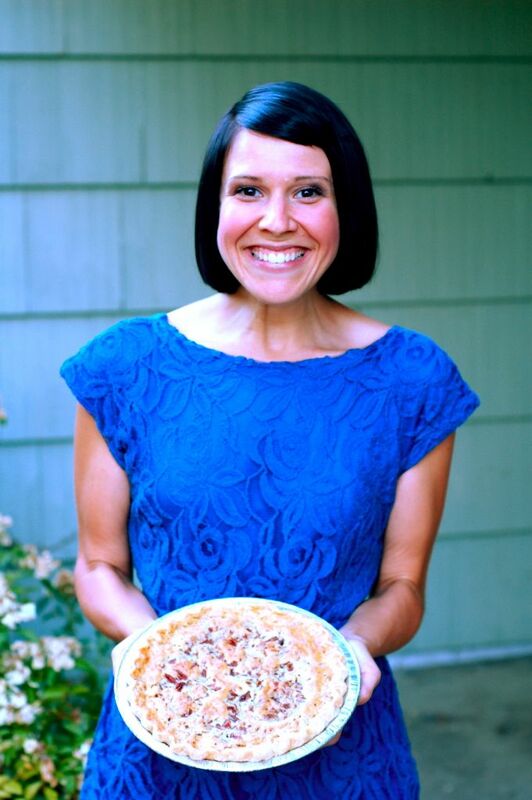 The pie and blog were amazing, and couldn't have come at a better time. I love you, my dear friend.